We are very happy to welcome the newest members to the Citydeep Family, and straight off there smash hit for Sole Channel records. DaSoul, Fabry Diglio & M.A.D. 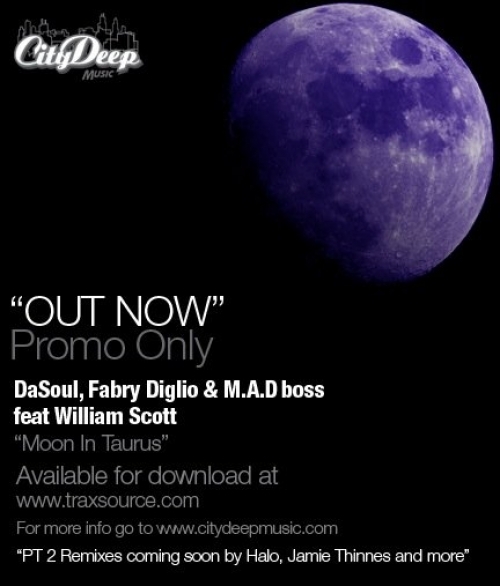 boss brings a brand new jam that moves in between deep and soulful house with out a missing beat! Moon In Taurus kicks it off with a dark and dirty feel but before it has worked its magic you have moved through deep and soulful to take listener on a ride. Play this one loud and watch the dancefloor come together as one! Per poter postare o commentare devi essere loggato. Puoi effettuare il login dal box in alto.